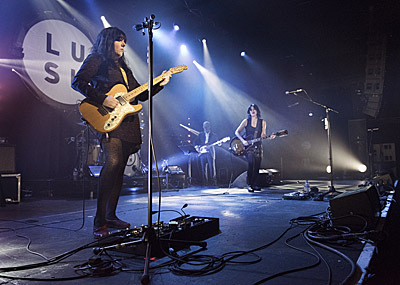 Tonight is a truly momentous occasion as Lush play their last ever gig. These legendary purveyors of ‘shoegaze’ originally split in 1996 after the sad death of drummer Chris Acland, but reformed last year to record an EP and play UK, European and US dates. However, with bassist Phil King’s recent decision to quit, the band have finally decided to call it a day. For tonight’s final gig, front-women Miki Berenyi and Emma Anderson and drummer (since the band reformed) Justin Welch are joined by Modern English bassist Michael Conroy.